CAPE CANAVERAL, Florida -- NASA's planned ferry flight of space shuttle Endeavour atop the 747 Shuttle Carrier Aircraft (SCA) has been postponed until Wednesday, Sept. 18 due to an unfavorable weather forecast. NASA managers have postponed the ferry flight of space shuttle Endeavour to Wednesday, Sept. 19. The decision was made to ensure a safe flight for Endeavour and the Shuttle Carrier Aircraft. A low pressure front in the northern Gulf of Mexico is generating thunderstorms along the predicted flight path. On Oct. 11, 2011, NASA transferred title and ownership of Endeavour to the California Science Center in Los Angeles. Despite the one-day delayed departure from Kennedy, NASA still plans to transport Endeavour to Los Angeles International Airport (LAX) by Thursday, Sept. 20. In cooperation with the Federal Aviation Administration, the SCA is scheduled to conduct low-level flyovers at about 1,500 feet above locations along the planned flight path. The exact timing and path of the ferry flight will depend on weather conditions and operational constraints. Some planned flyovers or stopovers could be delayed or cancelled. If the ferry flight is postponed again, an additional advisory will be issued. At sunrise on Sept. 19, the SCA and Endeavour will depart Kennedy's Shuttle Landing Facility in Merritt Island, Florida and perform a flyover of various areas of the Space Coast, including Kennedy, the Kennedy Space Center Visitor Complex, Cape Canaveral Air Force Station, Cocoa Beach, Cape Canaveral and Patrick Air Force Base. The aircraft will fly west and conduct low flyovers of NASA's Stennis Space Center in Mississippi and the agency's Michoud Assembly Facility in New Orleans. As it arrives over the Texas Gulf Coast area, the SCA will perform low flyovers above various areas of Houston and Clear Lake before landing at Ellington Field near NASA's Johnson Space Center. 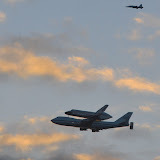 Social media users are encouraged to share their Endeavour sightings using the hashtags #spottheshuttle and #OV105, Endeavour's orbiter vehicle designation. Beginning Oct. 30, the shuttle will be on display in the science center's Samuel Oschin Space Shuttle Endeavour Display Pavilion, embarking on its new mission to commemorate past achievements in space and educate and inspire future generations of explorers. Endeavour completed 25 missions, spent 299 days in orbit, and orbited Earth 4,671 times while traveling 122,883,151 miles.